This salad is so simple, but truly one of my favorites! 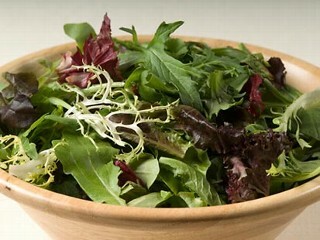 Start with mixed greens. I like to go with something that has a lot of flavor. Try arugula, baby spinach, beet greens, red or green leaf lettuce... or buy one of those convenient mixed bags. Now, drizzle on a bit of olive oil, squeeze on some lemon juice, salt and pepper to taste, toss, and wha-la, you're done! It's as delicious as it is simple. If you want to shake things up a bit here are some fun add-ins that will look beautiful on your valentine's plate. 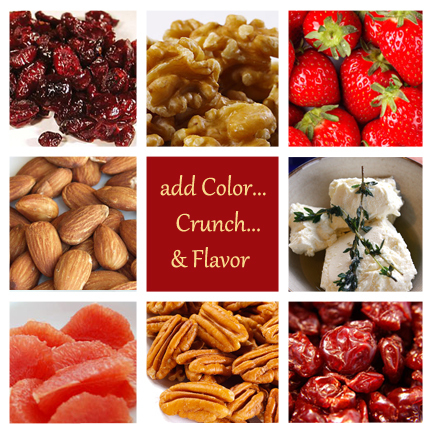 Dried cranberries, walnuts, strawberries, almonds, feta, grapefruit, pecans, or dried cherries. Mix and match however you like. oh, and if you haven't already, make sure to check out our Valentine's Day Menu.